A single or twin-engine aircraft cockpit jampacked with gauges of different types and sizes might look awesome or look like a spaceship to passenger or friend you are trying to impress but for the pilot – they are a pain to keep track of during a flight. The pilot can’t possibly be keeping track of all the gauges and also fly the plane at the same time. True, each gauge provides vital information on a particular part of the aircraft engine. This reminds us of wrist watch – most of them even today, display just the time. Newer models display time and date – maybe even the day of the week. Still newer models incorporated a chronograph, a stop watch and even have an alarm. The latest are the “digital smart watch” that can even display your heart rate and how many step you walked during the day. As technology improved so did the number of features on the once humble wrist watch? Ditto the gauges in the aircraft cockpit. Earlier they used to be analog only. Today, digital versions are available. As an aircraft owner, you can either choose to replace a single old analog gauge with a slim-line digital version of it or, you can replace a whole bunch of analog dials and gauges with a single slim-line digital gauge. Well, “slim-line” means it occupies very little physical space so everything of importance can be placed right in front of the pilot instead of being spread all over the cockpit. Another major difference is that modern slim-line gauges are ‘digital’ meaning, they display the data in numbers or graphs or numbers and graphs instead of a needle on a dial. Numbers make it more accurate. So instead of (say) displaying three-quarters on a dial for fuel in the tank, you can now see the exact quantity in litres or Gallons. Naturally, the connection between the slim line gauge and the aircraft engine will also change. The new replacement will be a sensor and wires connecting the sensor with the slim-line gauges. The wires transmit data in electrical pulses that could be interpreted by the smart electronics circuits inside the slimline gauges. Of course, you could go the whole nine yards and install an Engine Data Manager (EDM) which in turn is about the size of an iPad and replaces a whole range of Aircraft Gauges. So, instead of having several gauges – slim-line or analog, you have just one EDM. The EDM did not just replace analog gauges, it also replaced by displaying several sets of data in a single window. The EDM is capable of displaying data for fuel, Oil temperature, OAT, RPM, Voltage, Manifold Pressure Sensor, OIL Pressure and so forth. In fact, not only does it display the information, it can also be programmed to trigger an alarm for abnormal readings e.g. low fuel level, abnormal oil temperature, abnormal pressures etc. In most cases, single and twin-engine aircraft owners who had analog gauges, usually replaced them with slim-line gauges and later on, upgraded to EDM’s. Some who had the budget, went directly from analog gauge to EDM. How you proceed depends entirely on your budget. 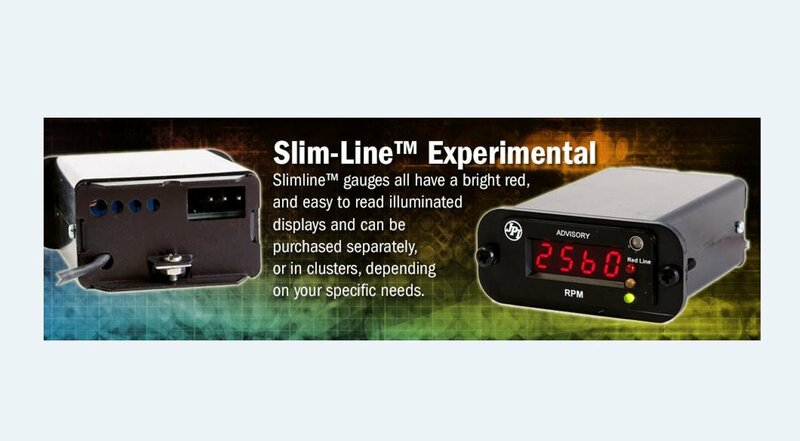 The difference between slim line and EDM is that each slimline gauge usually displayed one piece of information. So, you had a Slimline Instruments for OAT, RPM, Oil Temp Probes, Voltage, Manifold Pressure, OIL Pressure and so forth.